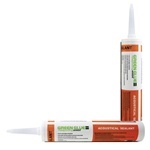 Acoustic Caulk, or noiseproofing sealant, is designed to seal gaps along walls, ceiling, floor, windows. Any small penetration that allows air to flow through diminishes the effectiveness of a soundproofing system. Use of an Acoustical Caulk Sealant maintains the Sound Transmission Class (STC) of all surfaces in a room. The Acoustical Sealant, as opposed other construction caulking, remains flexible below the surface and serves to dampen transfer of structure borne sound between drywall, wood, metal studs, concrete or other construction materials. Apply continuous beads of sealant around all openings formed by outlets, lights, etc.